First off, my apologies – I know it has been a very long hiatus, & a very busy couple of months for me both personally & professionally (I’ll be posting a job update later – stay tuned! ), so now I’m ready to get back to blogging & chatting with you all, starting with the latest & greatest in what’s #trending! A very cynical Offbeat article by an even more cynical writer was released trying to shame certain wedding trends, calling them “hipster,” “dumb,” & a whole other slew of less-than-intelligent monosyllabic words with no actual backing or research. So I’ve decided to take the very same things that bitter author wrote about & debunk them, showcasing exactly why you actually SHOULD incorporate them into your own special days instead! Mason jars are multi-purpose containers; not only do they make great country chic glassware for that romantic, rustic barn wedding, but they can be transformed to befit any & all wedding themes, serving as centerpieces & decor, wedding favors, lighting, & so much more! There wasn’t much commentary in the article as to why you SHOULDN’T have personalized wedding shoes besides “there are other options,” which we are all very aware of (thank you, Captain Obvious). Personalized wedding shoes are a great memento from your special day, giving you the chance to reflect back on that day every time you wear them! Monogramming & personalization is a huge rising trend, & not just because you’re guaranteed to pretty much never lose the item! The customization & ability to make an item – even your wedding shoes – your own is what everyone wants; we all want something that is just uniquely ours! Check out Figgie Shoes for some serious wearable works of art, celebrating you & your special day. Let’s get one thing straight: not everyone likes cake (see my National Ice Cream Day post for example!). An awesome alternative to the traditional dessert has risen in the midst of cake-haters, & an even more-awesome way to display it, too! Think about it: yes, you could totally have boxes with a pair of donuts in each, or go through catering to have them “serve” the donuts for you at your venue, but the Great Wall of Donuts is an eyecatching, fun, easy, & germ-free way to grab & enjoy the sweet treat (so that you can quickly get back to that dance floor!). On a similar tune to the Donut Wall debacle, just like how not everyone likes cakes, usually the culprit behind their distaste for the dessert is the presense (or sheer amount) of frosting. Naked cakes became the happy medium for couples that still wanted to enjoy a traditional dessert on their wedding days, but opted for less frosting & more savoring the actual cake itself! Chrissy Teigen & John Legend were one of the first to opt for this option befitting their romantic & rustic Italian lakeside wedding, & inadverdently started a huge trend! There is a reason they call it comfort food: that warm, happy feeling (pre-food coma) from eating savory foods during the holidays makes you want to cuddle up by a fire with a fleece blanket & enjoy family time. There is no shame in incorporating your favorite holiday foods in your wedding day, especially if the date falls during late August – December! Add a twist to the buffet-style serving by making a mashtini station, where scoops of mashed potatoes can be featured in martini glassware/plasticware alongside fan-favorite mix-ins! Overdone & referred to as “the worst fabric of all time.” Well, I’m here to tell you that burlap is a multi-purpose, inexpensive, & easy-to-coordinate fabric that adds a flair of rustic appeal, while still working well with your overarching theme & color palette. The neutral tone & texture is unique to burlap, & can be cut & shaped to befit any decorum, accessory, & need! The OG of party dessert: the chocolate fountain. What I love about chocolate fountains is that this is something that everyone across all ages can enjoy taking part in! Kids love it because 1) it’s chocolate, & 2) it has the potential to be very messy. Adults love it because 1) again, it’s chocolate, & 2) it is a fun & alternative method to every-day eating! If you are truly worried about the mess it could potentially cause, situate the fountain in it’s own dessert corner/area so that it is safe from drunk & disorderly bystanders & children running amok alike! Gray is elegant, neutral, clean, pristine, rustic, & NOT just reserved for cloudy days & funerals. Whether an accent color or the focal point of your event theme, don’t be afraid to experience any of the many shades of gray! I’m calling out all of my sweet-tooths to band with me on this one – CANDY IS DANDY, Y’ALL. A candy bar is an awesome & unique addition to the dessert area, or just as an alternative to the traditional sweets usually delved out during the event! The sweet treats are sure to be not only a crowd-pleaser that gets them up & running to the dessert area, but also gets them to the dance floor from the sugar rush! Plus, it gives your guests a wedding favor they are sure to enjoy! Asking your squad to be by your side for all the wedding mayhem that could happen before, during, & after the event, help you hold your dress while you use the bathroom, combat any unruly relatives, & still ensure that you have the best night of your life IS A BIG DEAL. If you want to elaborately “propose” to your bride squad, I say go right ahead & please send me the pictures! I am all about ensuring that everyone feels special & included, and there is nothing wrong with making your besties feel a semblance of how you felt when your future spouse popped the question! The point of signage is to help the flow of traffic, keep people informed, & exhibit information. It’s almost essential to have some form of signage in your wedding, whether it is table seating charts, directions to the bathrooms or reception areas, or fun decor! Plus, it’s an opportunity to be creative with phrasing & colors, can be customizable to fit your theme & even have your unique relationship, &/or what you bond over as a couple together, incorporated into them. For those of you that don’t know, a sand ceremony is one of many forms of the tradition of symbolically unifying the couple during the wedding ceremony, usually involving two or more different colored sands that represent the couple as individuals, & combining them together in one container, representing their marriage. As far as calling a sand ceremony or the container of your choice “ugly,” it’s a lot like shaming the couple for wanting to symbolically celebrate their union out of bitterness. And don’t worry, there are plenty of beautiful sand ceremony containers (like the one above) that you would be proud to showcase in your home. This is totally a personal preference, like wearing customized Chucks or sky-high stiletto heels. Don’t bag on a person’s shoe preference for THEIR wedding day, it’s THEIR choice! If you want to wear cowboy boots to your beautiful, rustic barn wedding, DO IT. If you want to rock $800 red-soled heels, DO IT. Get the thought out of your head that your wedding day is supposed to live to anyone else’s expectations & standards except for you & your future spouse’s, & walk all over those hateful opinions in your boots. Ring photography is truly a work of art, & when it’s framed &/or blown up on a canvas, it can be such a statement piece of art for your home that you can look at & reminisce on your special day. On a related note to the cowboy boots, barn weddings set the perfect tone for a romantic, rustic event. Critiques were posed that “city people” shouldn’t partake in having a barn wedding because they don’t live on a farm, but that is such a limiting, ignorant position to take, when in reality the universe should be the limit on your wedding day & where you want to hold it. To my fellow city-slickers, barn weddings are rustic & beautiful, & you should not be afraid to have your wedding in one just because you didn’t grow up on a farm. Succulents are the perfect form of greenery to add to bouquets & centerpieces. Not only do they transport well & have more durability than flowers, but because they are a part of the cactus family they’re very easy to keep alive, requiring very little attention even post-event, ensuring that you can keep them alive for much longer than any regular flower arrangement. The aforementioned cynic has, surprisingly enough, made an insightful point regarding his & her cocktails: not all brides want a sweet, “girly” drink, & not all men prefer whiskey on the rocks. Since there was no [intelligent] afterthought at all, I figure I’d finish this by saying that his & hers cocktails are yet another great way for you to incorporate the unique couple that you are. Put all judgments aside of what people think you should be drinking, & remember that this is your day to celebrate & party the way that YOU want to! I’m feeling personally victimized by this article if they’re hating on having cupcakes. Cupcakes are for EVERYONE, not just for kids’ birthday parties or school bake sales. Have your CUPcake & eat it, too! Macarons are so not over, folks. If you’re not a cake (or cupcake) person, they make for a great dessert alternative, & also party favors everyone is guaranteed to enjoy! Let’s all be real for a second, everyone loves a good pun/dad joke. And when you can make it work with the theme of your event, be all for it! Your wedding day is supposed to be filled with laughter, fun & happiness, & incorporating puns as part of the event will be sure to get a rise out of you & your guests alike! I’m taking this one personally as a dog-owner. There is absolutely NO REASON why you shouldn’t include your best furry friends on your special day, especially if the dog is a family pet &/or the couple’s! You also have to remember that not everyone has small children at their disposal for the roles of ring bearers & flower girls, so your 4-legged companion can take on the role with pride & tail wags for days! Plus, think of how cute those wedding pictures are going to turn out (i.e. see above)! Pro tip: have a leash, food & a water bowl, & some treats on hand to keep your pup entertained & happy before, during & after the festivities! I love the idea of doing themed tables instead of the traditional table numbers with seating arrangements, especially when the table theme is centered around something that is unique to the newlyweds! Not being able to pick where you sit sometimes isn’t the most ideal of situations when you’re attending these events, but having a themed table is a great ice breaker to get guests who don’t know each other that are seated together talking! In my single days, I went to many weddings & not going to lie, I slightly dreaded having to stand there basically announcing to the world that I’m still waiting for my own Prince Charming. But there was also something so thrilling about being up there, competing for that intricately-arranged bouquet in which catching it signified that “you’re next!” It was a total adrenaline rush, & now that I’m married & get to watch from the sidelines, it is one of the most entertaining sights to behold in person. Nixing this tradition would not only slightly disappoint your single ladies, but also the guests that secretly hope for a catfight to happen! I am loving this metallic trend that has been on the rise for the last couple wedding seasons, as opposed to the traditional, all-white tiered cakes that make me yawn. Metallics are not only aesthetically pleasing, but pair well with virtually any color & theme you have going on with your event! P.S. “It looks like it tastes like pennies.” Grow up, author. As a former Bridal Stylist & Consultant for David’s Bridal, I truly loved my time getting to interact with brides of all ages, sizes, backgrounds, & of course personalities! Each one had different expectations, needs & desires for their dream gown, but budget was the difference I found to be the most prevalent. Ladies, let me tell you straight: the wedding dress of your dreams is attainable, no matter what your budget is. I’ve had brides from every financial background & I can tell you with 100% honesty that you can & will say yes to your dress, whether you’re spending $100 or $10,000 on it. That being said, if you want to drop $10,000, I say absolutely go for it, but take care of your dress afterwards. Have it dry-cleaned, preserved (both David’s Bridal & The Knot have dress preservation services), or kept safe for future generations to potentially use! 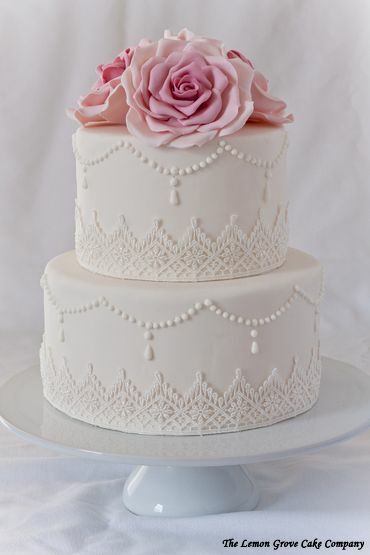 I have to hand it to cake decorators because it is not easy to bake perfect cakes & create intricate designs (like the one above) with fondant. It is such a beautiful art, & there are endless possibilities with colors, shapes, designs, you name it. And for those of you Negative Nellies out there that aren’t a fan, don’t eat it, plain & simple! The champagne flutes you use on your wedding day are symbolic, as you cheers to starting this brand new adventure with your best friend by your side. Wedding day champagne flutes aren’t just for the day-of either; you’ll be sure to find a reason to pull them out on special occasions – like anniversaries & other milestone celebrations! It gives you a great excuse for you & your love will always look back on that first toast & reminisce the great memories from your wedding day. This particular topic is an extremely personal one, & is very subjective to each individual person. Your wedding day is supposed to be the very beginning of the next chapter of the rest of your life, the opening “Once Upon a Time…” if you will. On that day, there is a huge expectation of not only feeling your best, but looking your best, & let’s face it: we all want to feel the most special, the most attractive, & our absolute best on our wedding days. If you are a firm believer in that “sweating for the wedding” is going to help you achieve that level of happiness that you rightly deserve, I’m all for it! What I’m not a proponent for is that EVERYONE has to lose weight for their weddings, which is definitely not the case. Do whatever makes you happy, & whether it’s losing or gaining, remember that your future spouse fell in love with ALL OF YOU, just as you already are, & that is perfect for them. At the end of the day, remember that it is YOUR special day, & no one (myself included!) can tell you exactly how or what to incorporate in it. Do whatever you firmly believe is going to not only make you happy that day, but also help put your best foot forward going into this next exciting chapter! & as always, reach out to me if there is anything I can help you with!